Had a brilliant time at Horror in the East last Saturday. 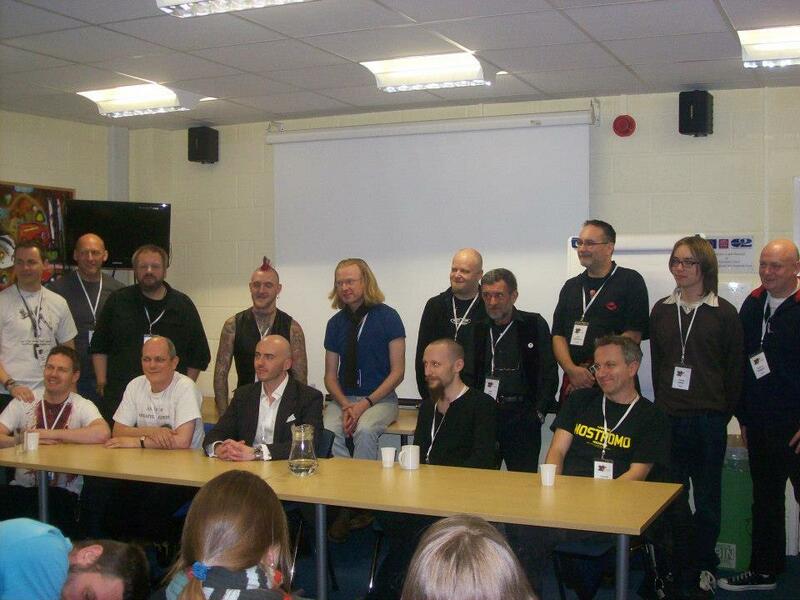 I’ve said it before and I’ll say it again – it’s a lovely little convention which boasted a host of top guests. It was great to catch up with old friends again and to take in a long-overdue viewing of the BBC’s controversial (back in 1992) GHOSTWATCH. Thanks to Henry Baker, all the day’s panels were recorded for posterity and are available on YouTube for your viewing pleasure. To save you a click, you’ll find the Armageddon-related discussion featuring myself, Adam Baker, Sean T Page, Adam Millard and Simon Coleby at the bottom of this post. Huge thanks to Emma and Jo, the event organisers – you did a cracking job, ladies. Here’s to next year! Don’t forget – this Saturday I’ll be at my final event of the year, the annual Day of the Undead at the Phoenix Centre, Leicester. Click here for information. Hope to see a few of you there! Bloody hell, I enjoyed that! This weekend saw the inaugural Horror in the East convention in Lowestoft, a place which, as you know, is very close to my heart (not least because I pretty much destroyed it in THEM OR US!). I go to a lot of events, and I decide not to go to many more. I’m a fussy sod – much as I genuinely love talking to other authors and publishers etc., I have to say I prefer meeting readers. Many conventions seem to be one thing or the other, but Horror in the East was a straight down the middle collision of both. Relaxed, informal and well supported by both the local and the horror community, it was an absolute pleasure to be there. Congratulations to Emma Bunn and Jo Wilde for putting together such a superb event. I’ll be back for more Horror in the East on 1st – 2nd November 2013, and I hope to see many of you there. Pictured: the excellent Horror in the East line-up. From left to right: (front) Richard Cosgrove, Andrew Hook, Joseph Freeman, Michael Wilson, Conrad Williams, (back) Sean Page, me, Adam Baker, Adam Millard, Joseph D’Lacey, Simon Coleby, Ivan Bunn, Iain McKinnon, Henry Baker, Paul Huggins. (Photo pinched from Adam Millard on Facebook – hope you don’t mind, Adam!). Early TRUST reviewer Chris Bowsman said of the book “The payoff is immense, and once it gets going it’s like dozens of pages of falling down the stairs. Very highly recommended.” We’ve now reached the top of the staircase. From now until the end of the year/world, TRUST will be an intense read. Chapter 27 is available now, and if you haven’t been following the story from the beginning, read it all at www.trustdavidmoody.com. More to come on Monday. Also coming up next week, more from my AUTUMN retrospective ahead of the imminent release of AFTERMATH in the UK, and I’ll be out and about as the “Never Trust a Man With Hair” tour continues. It’s Cheltenham Waterstones on Wednesday with Wayne Simmons, Adam Nevill and Joseph D’Lacey, then Horror in the East next Saturday (which, as I hope you already know, features a host of authors and is completely FREE!). And finally, for a chance of winning copies of the AUTUMN books, check out the giveaways accompanying my recent guest posts at www.crazy-bookworm.com and www.bookchickcity.com.